Welcome! This website showcases ongoing research into the community of Rosewood, Florida – a majority African American town destroyed during a 1923 race riot. This project draws on archaeology, documentary research, oral history, and interactive media (VR) to investigate the history of Rosewood and share it with as wide an audience as possible. The links above provide an introduction to the history of Rosewood, ongoing work to document this history, and efforts to communicate this research with the public. The Data Warehouse provides links to oral history transcripts and census data. The Virtual World is at the heart of public outreach efforts. The next phase of the project centers on (1) an expanded archaeological project funded by the State of Florida Division of Historical Resources, and (2) updates to the virtual world producing a more interactive experience titled Rosewood: An Interactive History. Interested in supporting our work? Join the email list! Thanks for taking an interest in this exciting project. 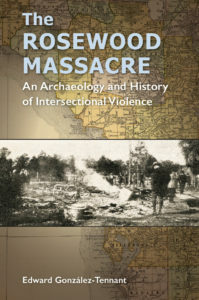 The Rosewood Massacre: An Archaeology and History of Intersectional Violence available from UPF, use code SAA19 to reduce the price to $35.